July is garlic time here at our farm,. We’re busy harvesting, cleaning, hanging and selling heady, beautiful hard-neck garlic. It’s an intense time for a small farm such as ours. Each step of the process is by hand so although time consuming, it’s definitely a labor of love. 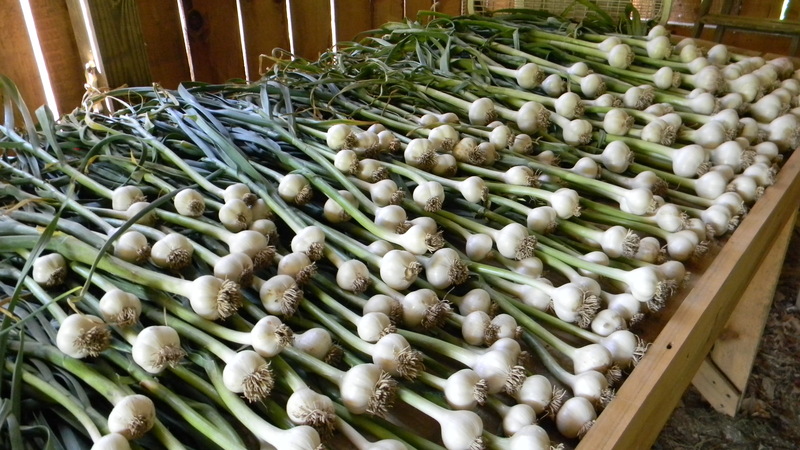 There’s nothing quite like fresh garlic and many of our customers buy large quantities. 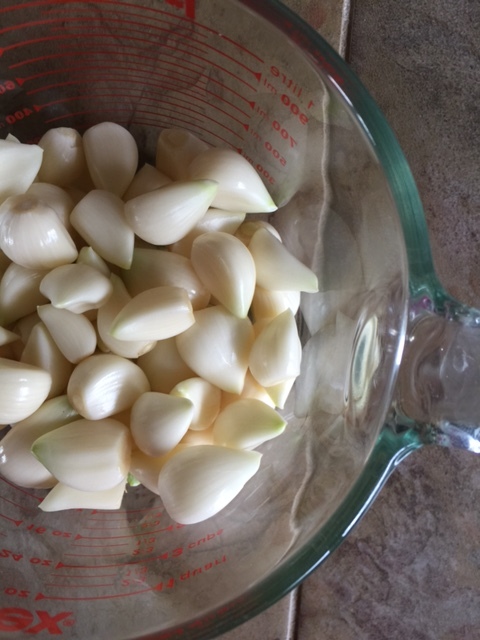 When stored properly garlic can last well into the following year, while adding that welcome punch to so many recipes. 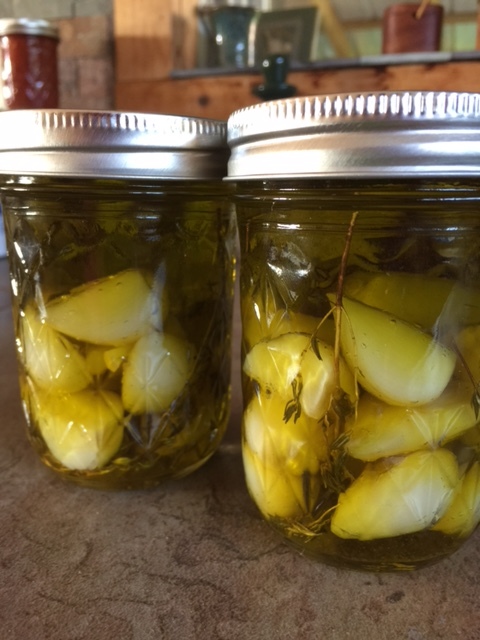 One way to preserve garlic is to make a “confit”. The French verb confit means “to preserve.” The term confit in our country has come to mean to poach something in fat at a low temperature for a long time. During the growing season I am always looking for ways to preserve and extend each crop. Many times while harvesting garlic we have ‘dingers’; heads that we accidentally sink a shovel into or rip the roots off by pulling a little too hard. We collect these and rather than resign them to the compost pile, we turn them into a delicious garlic confit. These make wonderful hostess or Christmas gifts and can be used in a variety of ways. Try them as a dipping oil for crusty artisan bread, add them to bean soups, to pasta, mashed potatoes or even roasted red peppers for a great bruchetta. The possibilities are endless, limited only by your imagination. Who wouldn’t love a jar of this liquid gold? Place garlic, herbs, oil and any additional ingredients you have chosen in a medium heavy saucepan. Cover a cook over very low heat for about 30 minutes. Don’t allow the oil to rise above 200 degrees F. You may see small bubbles rise to the top. To check for doneness, take a paring knife and test a clove. It should be very soft; if not, poach for an additional 10 more minutes. Remove pan from heat, keep covered and allow to cool to room temperature. 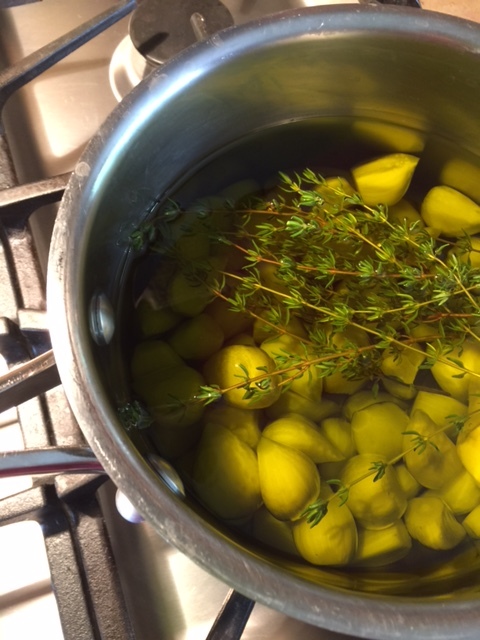 Using a clean spoon, divide garlic, herbs and oil among resealable jars. (I use 1/2 pint jelly jars) Can be kept in the refrigerator for up to 4 months.